Try to have your family or the group you meet with imagine the situation of the people Christ taught. They came from far and wide to seek Him, hoping to be healed. The Bible says “multitudes” sought Him. While He ministered in Galilee, people flocked from what is now Southern Lebanon, Syria, Northwestern Jordan, all around Galilee, the Jerusalem area, and the Judean Wilderness, many of them making the pilgrimage on foot, sometimes over 100 miles. You could call these people a “mixed multitude.” When Jesus performed His miracles in Galilee He had already been down to Jerusalem for the Passover, where Galileans saw miracles during their own pilgrimage there. Thus, some Galileans had begun to believe when at first they rejected Him. His fame spread in Galilee as Jews returned from the Passover. It spread through Samaria because of Jesus’ conversion of the Samaritans in Sychar, where the “woman at the well” bore testimony of Him. Remember that nearly all the Jews viewed both Jesus and John the Baptist as Scribes. Scribes wrote and translated documents and were well-versed in local law and the Law of Moses. Because they were fluent in Hebrew, the language of the scriptures, and the local languages of Aramaic and Greek, they could translate the scriptures and teach the people. Because there had been no prophet in Judea or Israel since Malachi, around 400 B.C., people relied more and more on the high priests and these wise sages. Scribes could be of any persuasion in Judaism — so a scribe could be either a Pharisee or a Sadducee. So people would have to listen carefully to discern a scribe’s point of view. Both Christ and John the Baptist were curiosities. John was a Levite who didn’t engage in temple service. The Jews knew all about the mikveh, the ritual bath used for purification, and John did immerse people in “living water” by immersing people in a tributary of the Jordan River. That all looked somewhat “kosher.” But John preached of a Messiah, which Messiah had already arrived, that “baptism” was in preparation for receiving the Holy Ghost. Jesus was not the Messiah the Jews expected. Jews saw no need for a mediator between themselves and God. The Messiah they sought was not the Son of God, but a new Davidic king who would triumph over their enemies. They did have a view of a millennium of peace under a magnificent king, but not under a divine king. Jesus, a descendant of David, was born and raised in humble circumstances, had no military inclinations, spent His time teaching and healing, visiting with “publicans and sinners,” and even healing a Roman Centurion’s servant. He angered many, confused many, and caused some to begin to feel towards the Spirit. These gained a spiritual witness that Messiah had come in this odd way, this odd form. They followed their hearts along what would become a dangerous path in mortality, but that could lead to eternal life. The Jews had stories of miracles in their scriptures. But the stories of healings, or of raising someone from the dead, were very old and very few. In fact, there are only 12 healing miracles recorded in the Old Testament, aside from those during the Exodus. Christ mentioned the healing of Naaman the leper (by Elisha) and the son of the widow of Serepta (by Elijah). He insulted His neighbors in Nazareth with these stories from the time of Elijah and Elisha, because both these people were Gentiles. There had been no healings since the Babylonian captivity in Judea or Israel that were recorded in the scriptures. But hope for healing drove the multitudes to find Jesus. Jesus began slowly and impressed upon those He healed that their faith had made them whole, but soon He was healing many among the multitudes, and we don’t have a record of His counsel to them. 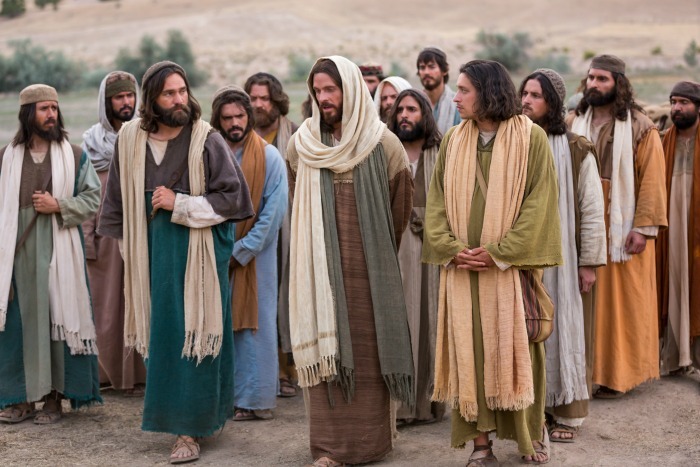 Christ called 12 apostles, all of whom were Jews. In Leviticus a lengthy piece of instruction is given to priests for identifying symptoms of leprosy and then figuring out if it is indeed cured. The person suffering from this affliction would have to show himself to the priest, who would decide if he was unclean or ready to be accepted back into the congregation. This was probably Hippos on the shore of the Sea of Galilee. Part of Decapolis, most of the people were Gentiles, many of them Greek, and they just wanted Jesus to leave. That He was casting out devils and attracting a multitude scared them. While water poured into their boats and the apostles feared for their lives, Christ was sound asleep on a pillow. Those without fear can relate, but there are not many of us. Compare the story of Jonah, Jonah 1:5. “Cumi” in Hebrew is the word used to command a female to arise. But “talitha” is the feminine form of “wooly.” We can probably visualize the daughter of Jairus (a leader of a synagogue) to have very curly, wool-like hair.